Speedmonkey: Lower is better, so why do we buy so many SUVs? Lower is better, so why do we buy so many SUVs? Cars with a centre of mass as low and as near the centre of the car as possible tend to handle the best. Move the centre of mass forwards or back and the handling is adversely affected. The car will tend to understeer or oversteer depending on which way the mass moves. So the traditional Audi approach to a transversely mounted engine located forward in the engine bay lends itself to understeer whilst the Porsche 911, with its engine behind the rear axle, tends to oversteer. This is basic physics and something often spoken about by manufacturers when they eulogise about their cars, and that we take on board, understand and factor in when considering our next purchase. The centre of mass height (or centre of gravity) also affects handling. We all know sports cars handle better than others and that's because the centre of mass height is low. Indeed BMW went so far as to replace the steel roof with carbon fibre in the M3 CSL in order to lower its centre of mass height. A taller car with a higher centre of mass will roll when it goes round corners, but the higher centre of mass will also adversely affect the vehicle when accelerating or braking. This is due to something called load transfer. The load will tend to want to head towards the point the car had been travelling before the driver introduced braking or steering input. All this means the taller the car and the higher the centre of mass the cleverer the engineers have to be to try and overcome the effects of the simple physics involved. But, as Scotty used to say, "I cannot defy the laws of physics!" Which brings me to my point. Why, in the name of space and vanity, do we see so many tall cars on the roads? Extra space can be achieved through either building a taller or longer car. A longer car, as long as the basics of centre of mass are considered, will handle better than a taller car because the centre of mass is lower. Yet we ignore this and still want tall cars. The Mk1 Golf was 1395mm tall. The Mk7 is 1452mm. Now, all other dimensions have also grown due to safety and other factors but the height of the car has grown by 5.7cm and that will adversely affect its handling. This means suspension components have to be revised and the basic architecture has to cope with a car that is not only heavier (which we all know about) but also taller. No wonder the Mk1 was considered such a sweet handling car compared to later models. The Range Rover is an SUV by design and has always been engineered as a vehicle that is practical both on and off road. Its on-road manners will always be compromised by a high centre of mass, but Land Rover's engineers have carefully refined it over 43 years, in much the same way as Porsche have done with the 911, to create a car that is engineered to overcome, as much as possible, this deficiency in its basic architecture. However the Range Rover is tall and will always lean, much like the 911 has a rearward mass bias and will always tend to oversteer. But now we have faux SUVs where a tall, 2WD, car is demanded by the market for no more reason than to provide headroom that isn't required and so the driver can sit high up - just because they want to. This is eminently daft. There are two approaches to overcoming the higher weight of mass in faux SUVs. One is to engineer in improvements to handling, but this comes at the expense of more weight, which increases inertia in all the wrong places, or overly stiff suspension which introduces a terrible ride. The second is to ignore the height and let the car roll. Both are daft. The Dacia Sandero is 1523mm tall. The Dacia Duster is 1690mm tall. The Sandero is the better handling car at the expense of nothing more than some headroom. I used to own a 3rd gen Subaru Legacy Outback. I thought it was a great car but it did have a tendency to roll through corners. A standard Legacy estate would have handled better because the Outback is 100mm taller than the Legacy. In hindsight I was daft, but was dazzled by the fact the Outback was a better looking car with a higher spec. 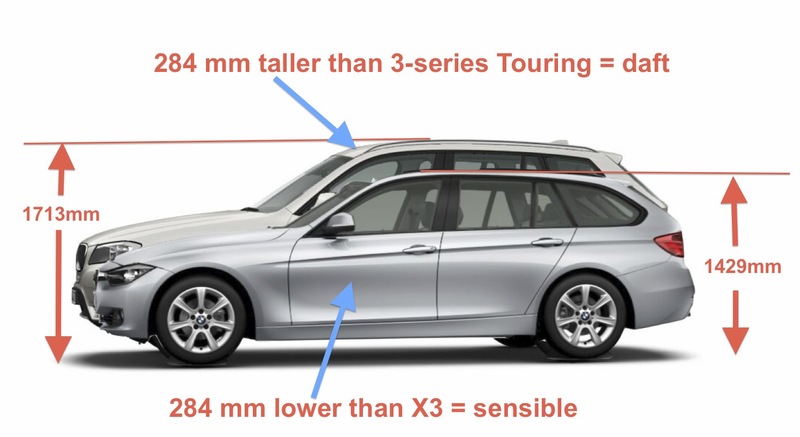 A BMW X3 is essentially a 3-series on stilts. Unless you really need to take it off road (which 99% of buyers won't) the 3-series Touring will always be a wiser choice. The X3 is 1713mm tall and the 3-series Touring is 1429mm. You will be carrying a whole extra 284mm in height around (with its associated adverse impact on handling) for no reason other than you want other people to look and point at you as you zoom around in your faux SUV. This is plainly daft. Yet the market loves SUVs. They are selling by the truckload in some kind of perverse 'I am considerably taller than you' competition that is at odds with the laws of physics. When it comes to buying a car the lower the better. Taller is dafter.